It's the heart of summer in Florida. Hot, humid and more humid. Swampy. I live in a very social city where many wonderful restaurants, bars and craft breweries are within walking distance. I love it. I don't drink much, but I do love me a glass of good red wine. You know it's all about keeping those arteries clear. But unfortunately life will separate me and the vino for a while. Sitting at a bar with a glass of water wears thin though. It doesn't look pretty, it doesn't make you feel especially social. No one puts any effort into a glass of water. An astute bartender sought to assuage my feelings of being left out by offering to make me a mocktail. Sounds dumb, I know, but this soution just never crossed my mind. Pretend drinking! Fake cocktails! Yes! No one would know (or care) that my hand-crafted drink was merely pomegranate and soda. It looked awesome. And it made me happy. Very much like—you know where this is going, don't you?—fake outdoor plants. Ultimately, who knows and who cares what's in the container? Is it quality material? Does it look real? Does it make you feel good? Are you happy? Real plants take real effort. I say less work, more enjoyment. 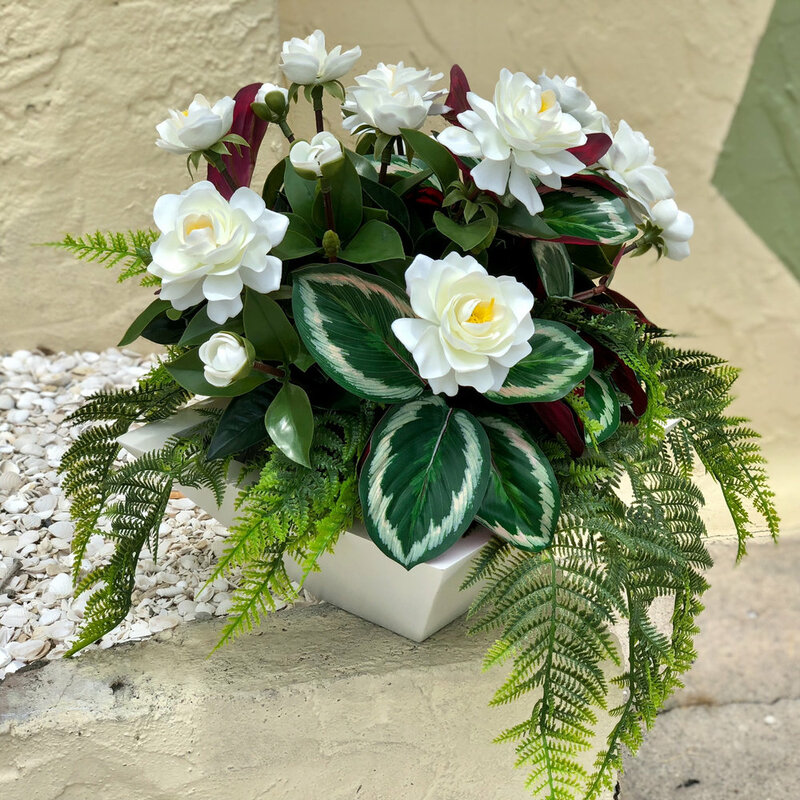 Embrace the freedom of outdoor artificial container plants. You can still have your big beautiful palms and flowering shrubs. Let Mother Nature manage that to-do list. Put away the watering can and pour yourself a glass of wine—or make me a mocktail?—and we'll do this together.